Hong Kong is an amazing place, have four distinct seasons.One of the most famous modern city in the world. More grateful is ForME HONEY can find the suitable place at Tuen Mun Wo Ping San Tsuen in Hong Kong. We name this place BEE Land, which mean the place is for the BEE to harvest honey and enjoy their life. Bee Keeping need the right time, right place, and right social network. ForME HONEY put find the “right place” as the first priority. The BEE normally harvests honey in 5 km area, and next to our place is the Tai Lam Chung Reservoir and some small ponds, a lot of wild flowers for bee to harvest. When the season switch, the native fruit tree in the village will start to blossom. In March and April, we can get the fresh Litchi and Longan honey. Spring is one of the busiest times of year for bees, every day they carry the honey and pollen, make a round trip around 30-40 times. The taste of spring honey has a special flower aroma. Near the reservoir, there has a lot of Wild Ivy Tree growing around. The Ivy Tree flower starts to blossom at November time and last for few months. This is our source for the Winter Honey. Winter Honey has the rich sweet taste, can help to relieve a dry cough And have tonic effect. We are so blessed to find the natural environment to grow our bee. Next to our location, in the 5km is the Tai Lam Chung Reservoir and some small reservoir. The environment has few rivers and many greens. Normally Hong Kong has two times to harvest honey each year, Spring Honey and Winter Honey. In this fantastic environment, the bees can feel free to visit the flower, also can improve the environment. We have to watch out very carefully to keep our bee in BEE Land, no matter in which season. It is very important to check the Beehive, we can know that the group number of bees is that still maintain, the Queen Bee is that still inside the beehive, etc. So It is very challenging for us to keep the bee every year! Especially after the main blooming periods, we need to care the health of bee, need to face on their predator - Asian giant hornet. ForME HONEY is one of the Hong Kong Local Harvest Honey brand, seriously to do the quality check in the food testing center. Just because we care about our customers, want to give you the Best quality of natural raw honey. In order to ensure our ForME HONEY products quality, we send our 2015 New Spring Honey to the Hong Kong Standards and Testing Centre Ltd. (STC) to check the “Regulations Maximum Permitted Concentration of Certain Metals present in Specific Foods”. Now we are proud to announce that, our product PASS the Hong Kong government’s standard, there are 0% of metal toxicity in our honey. Moreover, we also test the nutrition facts of the honey. The result is our honey is rich of glucose (33.7%) and fructose(38.7%), so can prove that ForME HONEY is one of the best choices of natural product! The whole bee colony is leading by the Queen Bee, just like the matriarchal society. The Queen Bee is the only one of a colony able to lay fertilized egg. It is very important to maintain the number of bee by producing eggs. Worker bees are the largest population in the colony, also all of them are female. They forage for pollen and nectar, take care the queens and drones, feed larvae, ventilate the hive, clean up the nest, defend the attacker, etc. Try their best to preserve the survival of the colony. Drones are the male honey bees, their life have only one task – to fertilize new queens. Since they are not contributing to the big family, some honey bee colonies will eject surviving drones during not enough food for the colony. From the egg to the bee need around 20 days. After 2 more weeks they are strong enough to go out to harvest honey. The worker bee has only had 45-60 days life, if they are working in the florescence, their life will be little bit shorter because they are working hard. The Queen bee can live up to 5 years, she lays up to 2500 eggs per days. When conditions are favorable for swarming, the queen will start laying eggs in queen cups. A virgin queen will develop from a fertilized egg. 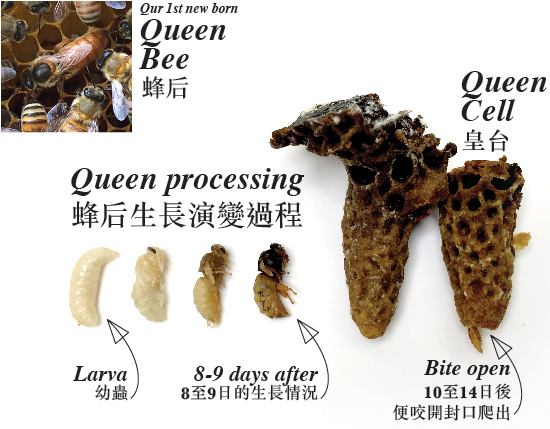 The main difference between the queen bee and worker bee is the young queen larva can get the heavily fed royal jelly to grow up. Royal jelly is rich in nutrition and protein, not only good for the queen bee, many ladies also like to have it regularly. After the mating, the drone bee will die, and the queen body significantly larger than the worker bees. The bee keeper has to choose the most suitable one to develop the New Bee Kingdom. We are keeping Italian Bee in ForME BEE Land, which is a subspecies of the western honey bee. The Bee hive in general separate in two layers, the upper side use to keep honey and pollen. The lower side use to breed their baby. All the Bee keep stick together in the beehive, inside have around five to six big piece of honeycomb. The beehive's internal structure is a densely packed group of hexagonal cells made of beeswax. After florescence, there will be an empty period for the Bee. Next to the BEE Land there still have some wild flower can supply a bit honey and pollen for their daily life. If they are lucky, could keep some honey for the winter time. No worry our BEE Land have not enough food for the bee. We already store some honeycomb and honey for them. They still can enjoy their honey to across their winter season. Why Honey Bee build the beehive with group of hexagonal? If you draw few circles next to each other, you will realize that surrounding some triangular gap between three of the circles. That will be a waste if the bee cannot use the small room. 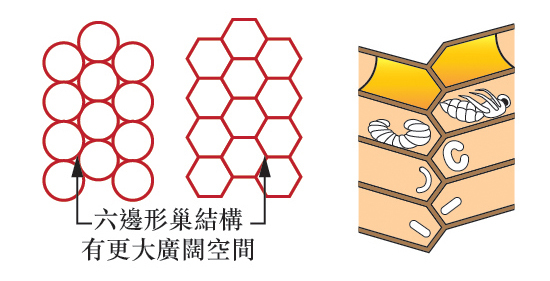 So the bee just easy to build it to be hexagonal, use the less bee wax to make the biggest room. *If you want to know more knowledge of bee, please visit our ForME BEE Land. Honey Bee has six legs, two pair of wings, one pair of compound eyes. Not that many people know that the bee have the other eye in the middle of head, that one is use for navigate when they are flying. Normally they just fly one to two km far from the bee hive. All depends on there is that have enough food for them surround their home. Although they are able to fly around 5 km far. If the bee fly too far to harvest honey, their life will getting shorter, and the wings also get damaged. At the end of their life cycle, they will change to protect the bee hive rather than fly outside again.